bbs.chrismoore.com -- View topic - Do you dream about flying? Do you dream about flying? I must have been thinking about that discussion here about the Matrix and bad science in sci fi books and movies because I dreamt about flying again last night. I love flying in my dreams unless I am being chased by something, which mostly happened when I was a kid. Anyways, I was curious about how many other people fly in their dreams and methodology. I don't flap my arms. It is completely will driven. Sometimes I can make myself go really fast, sometimes I lose power and start sinking. Sometimes, I can even carry someone, like Superman. Hope I'm not exposing too much of my warped psychological make-up. Although, if you want to psychoanalyse (sp?) me, go right ahead, it would be cheaper than seeing a shrink, I suppose. In any case, here's my question - do you fly in your dreams and if so, how? I sometimes dream about falling from great heights, but it's quasi-controlled fall. One time I dreampt that I was falling , but I could kind of steer myself, so I kept aiming to land in rivers and haystacks. It was a strange dream because I actually did land (in a haystack) and there was a flash of light and a voice that told me my uncle was going to die. He was really sick at the time. He didn't die, but it was an unsettling dream. I don't ever recall dreaming about flying on my own willpower. Usually it's something like that or I'm being sucked up by a tornado or something. Once in a great while I'll dream I can fly (own willpower as well), but usually I dream that I remember I could fly, and then I have a helluva time flying. It's usually frustrating, but there are moments of satisfaction. You really want to do some flying in your dreams, learn Lucid Dreaming. 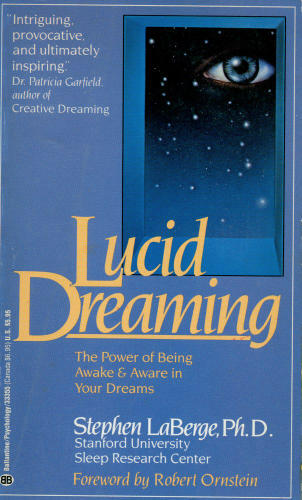 There's a few books on how to dream lucid (inc Key Weird, in it's own way), and once you get the hang of it, you can fly at will. You still have to be asleep, or at least at first. I've also dreampt I could levitate a few inches off the ground. Usually I can't control it though and I'm agraid someone will see me. I need to learn how to dream lucidly, but then that might take all the strange sponteneity out of it. I dream that I'm flying all the time. But it is usually a nightmare. Mostly because I am stuck in coach and I can never get the damn peanut bag open that the stewardess gives me. That's a very common nightmare. And then the next part is when they throw you off the plane because you pull out your knitting needles to try to open the peanuts and they think you're a terrorist. Am I right or am I right? I don't dream about flying in the way you're dreaming -- I dream about flying off of bridges while I'm either a passenger or the driver of a car. Scares the crap out of me. I don't dream about flying, but I do dream about "Great Heights"
Most of my dreams are about death. I have died in so many ways. My most popular one is while driving. It hasn�t happened so much since I bought my newer vehicle but on occasion I will have a dream about skidding off the road and crashing to my death. The worst are my dreams about dying while swimming because I don�t swim well as it is and there is always a shark that comes after me. Swimming dreams are bad. whenever I dream that something is coming after me i am running on a sidewalk and all of a sudden the cement becomes wet again and I run really slowly. Then the second the monster or animal or exgirlfriend gets me i wake up. Lucid dreaming is a favorite subject of mine. It's sometimes compared to meditation, but doesn't get nearly the attention from writers and media.